ST GEORGE'S, Grenada, March 25, 2019 /PRNewswire/ -- Range Developments has entered into an agreement with the Government of Grenada to develop the La Sagesse area in St David's. This is an unspoilt area of remarkable natural beauty with two beautiful beaches. The first of the luxury hotels will be the Six Senses La Sagesse, set on a promontory boasting two beaches and a lake, one of which has been described by The Sunday Times as 'one of the top ten beaches in the Caribbean'. La Sagesse will be an incomparable master-planned development on one of the best locations in the Caribbean, just 15 minutes' drive from Grenada's airport. It will feature two luxury 5-star hotels, oceanfront villas, spas, retail and water-sports' facilities. Range Developments specializes in developing luxury resorts in the Eastern Caribbean, and will be working with award winning Six Senses Hotels Resorts Spas. 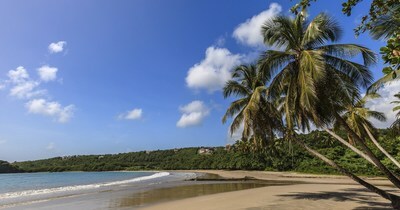 As in other of Range's developments, investors will be able to participate in the project, and if applicable, apply for citizenship in Grenada. According to Grenada's Prime Minister, Dr. the Right Honourable Keith Mitchell: "We are extremely delighted to welcome such an experienced hospitality developer to Grenada. Range Developments is well known for the high quality of its hotels and for the ability to deliver the results in our region. Our Government's policy is to bring investment and sustainable jobs to the country, and our partnership with Range Developments is an irrefutable proof to this. What's more telling is that this project will be based in a rural part of the country, St. David; showing our commitment to ensuring that every part of our Tri-Island State is developed." The project is scheduled to open in 2022, and will create more than 500 jobs during construction and many more during operations. "We have been impressed by the welcome and the opportunities in Grenada," said Mohammed Asaria, Managing Director and Board Member of Range Developments. "Six Senses which has been voted the world's best hotel brand by the readers of Travel+Leisure magazine in 2018 for a second consecutive year. We look forward to working together on this exciting project." On announcing the project, Six Senses President Bernhard Bohnenberger (BB) said, "We are very excited about coming to Grenada, the legendary spice island of yore. The ease of access from the United States and from Europe is also a very positive factor as these markets represent our two most prominent markets who embrace the quintessence of Six Senses. We are equally thrilled to work with the Government of Grenada and with Range Developments who are so aligned with our commitment to sustainability." Six Senses Hotels Resorts Spas operates 11 resorts and 28 spas in 20 countries under the brand names Six Senses, Evason and Six Senses Spas. Aggressive development plans will triple the portfolio over the next five years with resort, hotel and spa openings underway in Austria, Bhutan, Cambodia, China, Egypt, Fiji, France, India, Indonesia, Italy, Nicaragua, Switzerland, Taiwan, Thailand, Tunisia and United States. Six Senses operates resorts in far-flung locations of incredible natural beauty known for their distinctive and diverse design personalities. Each of the nine properties is supported by a leadership commitment to community, sustainability, wellness and design. Six Senses hotels which share the same vision and values found at their award-winning resorts will premiere in urban locations in 2019. Six Senses Spas offers a wide range of holistic wellness, rejuvenation and beauty treatments administered under the guidance of expert therapists. Six Senses Spas are located in all Six Senses and Evason resorts; 17 additional standalone spas are located in prestigious hotels and resorts as well as the premier class lounges of two major airports. Evason introduces a collection of two unique resorts that follow the Six Senses philosophy of uncompromised responsibility to sustainability and to the community. Family friendly, these properties also provide a strong value focus while offering a vast array of guest services and personal attention. Range Developments is an international property developer focusing on high-end hotel resorts in the Caribbean that are well-designed, sustainable and desirable. Its flagship project Park Hyatt St. Kitts is open to guests since 1 November 2017. This luxury resort has received multiple awards and has been widely recognized in the international media. CNN has singled it out as "the Best Hotel in the Caribbean" with Forbes naming it "a grand Caribbean debut that was well worth the wait". It has been included in Condé Nast Traveler's 2018 hot list "Best New Hotels in the world". Range has other developments in the region. The Cabrits Resort & Spa Kempinski, Dominica is the first government approved real estate project in Dominica under the country's Citizenship-by-Investment Program. The hotel is expected to open in 2019 and has recently been named "the most exciting new Caribbean property set to open in 2019" by the Caribbean Journal and Forbes. A minimum investment of US$ 220,000 in the project will entitle investors and their families to a citizenship of the Commonwealth of Dominica. It is currently under construction and the most advanced of any government-approved project on the island.